For centuries, homes have been using hardwood floors to create an elegant look while remaining durable – in fact, there are some homes that have been built in the 19th century that still have their original hardwood flooring, and the floors look just as beautiful as they did in the 1800’s! But in order for your hardwood floors to be long-lasting, you have to take care of them properly. Here, then, are our tips and tricks for properly taking care of your new hardwood floor. DO consider the type of hardwood floor you need for your purposes. If you have a household with lots of children, pets, and other “high traffic” inhabitants, engineered hardwood suits your purposes better than natural hardwood options. DO hire a professional installer to put in your new floor. We offer the finest, most affordable solutions in Indiana, so REQUEST YOUR CONSULTATION TODAY (put the link in here). DO clean your floor properly – use DRY mops to keep the area free of dust and debris. DO seal your floor properly – after staining the floor, use polyurethane to keep the floor sealed and properly maintained. DON’T walk on your floor with athletic spikes, high heels, or any other “hard” type shoe. DON’T install hardwood in places that will be exposed to excess moisture and/or humidity – keep hardwood out of basements, pool areas, and bathrooms. Excessive moisture and/or humidity can cause your flooring to “warp” and buckle. DON’T use improper cleaners (such as wax-based cleaners or harsh chemicals), steel wool, or excessive water to clean your hardwood floors. In addition, DON’T leave excessive dampness (such as a damp rug or a pet/child “accident”) on the floor for a long period of time – this can lead to staining & other permanent damage. Do you have any questions? Is there a particular topic you’d like us to cover? CONTACT US! 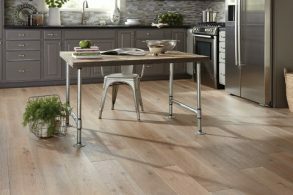 Hardwood Flooring: How Much Do You Need?